We would like to thank all Companists who have invested in us so far for placing your trust in our idea, especially as GroopDoo has only just entered the market and cannot provide historical figures yet. We are very proud that we have already won over more than 100 Companists. We have a high share of young investors. A total of 30% of our investors are under 30. This means that we can acquire Companists from our own target group as users. In our first update, we would like to inform you about our developments and show you which direction we have chosen. Partnership: Cheaper hotel bookings with HRS! We are currently working intently on developing partnerships with major businesses that can provide our customers with added value in addition to our services. 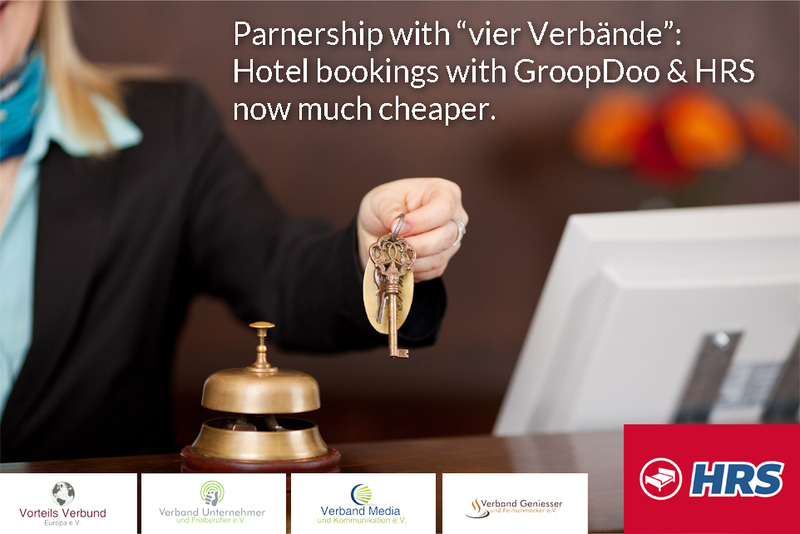 We are very proud to announce that, thanks to “Die Vier Verbände” (German association of service providers), we have entered into a partnership that will enable GroopDoo users to receive a 30% reduction on HRS hotel bookings! 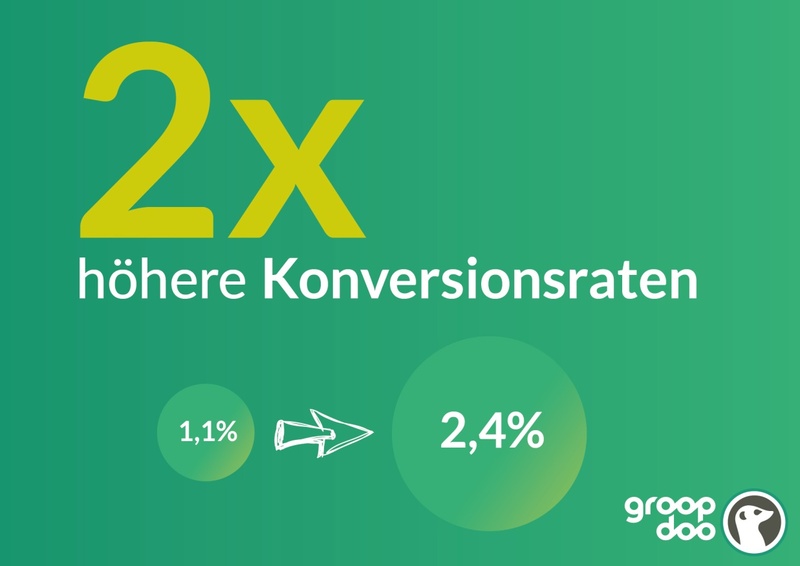 We joined "Die Vier Verbände" in order to provide our users with additional incentives, such as attractive discounts for certain activities. In the future, organizers will be granted access to the providers and the respective discounts after completing a successful activity. We are currently preparing implementation of this function in the platform. In addition to hassle-free and secure pre-financing of activities, we can now even help our users find a common service, accommodation, for group activities such as e.g. stag nights at a reduced price. The further development of the GroopDoo platform will be conducted flexibly and proactively, and will result in prompt updates. To this end, we are currently in negotiations with further potential partners in order to continuously expand our range for our customers. We have received a lot of media coverage since the launch of our campaign. On the day of the launch, press articles about GroopDoo were published on Finanzen.Net. Last week, a further press report on us appeared in mittelstand-Nachrichten. Since the launch of the campaign, we have registered an increase in clicks on our website as well as a measurable increase of our conversion rate "consumer of advertising becomes website user" in our primary advertising channel "Facebook Ads". This means that we have increased the conversion rate of our banner ads from 1.1% to 2.4%, or in other words: of 1000 users who saw an advertisement for our product on Facebook, 24 were interested in the product and visited our platform. In our industry, this is considered a good value. In order to continuously increase marketing activities, we also analyze which end devices our users use the most frequently. We found out that the majority of traffic originated from mobile devices (laptops, Android/iOS smartphones), which is why we have decided to focus our advertising campaign predominantly on mobile end devices. GroopDoo advertisements go down particularly well with women. A surprising 48 out of 10000 consumers were interested in an advertisement focusing on planning a New Year's Eve event. That is twice as high as the already above-average value. We are constantly developing the GroopDoo platform. On Friday, 04 November, we published a new platform update that includes improvements based on, among other things, the reactions of our users. We have significantly simplified the participation process and reduced the number of clicks by 50% for first-time users of the platform and, in particular, to facilitate participation in registered activities. We have also simplified and enhanced the procedure to invite friends and family to an activity via a special link: All Facebook, Twitter and Google+ functions have been directly implemented in the platform enabling users to e.g. post the link to Facebook or send the link to predefined groups or individuals. Sending invitations via email has also been simplified: it is now possible to access a prefab email in the window of the respective email client, including the link and details about the activity. Some areas of the platform (e.g. setting up a PayPal collective account, collecting money) have been garnished with additional information and dialogues in order to improve the user experience. On the development side, we are currently paying special attention to the user acquisition process. We want it to be as easy as possible to register on the platform, organize an activity, or participate in an activity. At the moment, organizers and participants are required to enter their email addresses, names and postal addresses prior to using the functions. Many users consider entering their postal addresses an obstacle for participating in an activity. Therefore, we now want to limit the required participation information to merely the email address. However, organizers will still be required to enter all obligatory information. This approach ensures increased security for the participants and provides sufficient information to contact the organizer in cases of conflict. Participants who are interested in commercial offers will still be asked to enter their postal addresses as they will be sent a proper invoice from the organizers in accordance with legal requirements. There were numerous questions related to our 1.3 million valuation. In the financial section of the overview under "company valuation", we refer to the potential of our business model under the headings "market" and "reference values for similar companies on the market". There, you can see that these, or extremely similar, business models, such as "TILT" in the US and "Leetchi" in France are doing extraordinarily well. In addition to the promising business model and the advantage of being the first providers of such a service on the German market, implementation of the entire platform based on Meteor and in consideration of the various APIs, most notably PayPal, was far from trivial. We had to cleverly combine various technical perspectives so that the remaining foundation, technical implementation, scalability and processing of payments would smoothly interlock. Senior developers performed a lot of pioneering and development work in this area. This enabled us to create an adaptable platform that can be easily expanded. After all, there are reasons why our predecessors failed at similar projects. The "students" and "clubs" groups are our gateway to the market. To this end, we take into account target groups with regard to seasonal aspects (see graduation parties, skiing trips, New Year's Eve parties, summer holidays). In spring 2017, for example, we will focus more strongly on financing for school graduation events. We estimate the number to be around 4,000 parties per year in Germany (In 2015, 433,000 graduates left school in Germany with an average number of pupils of 100 graduates per graduation class). If we address these school graduates correctly and win them over to the platform, they will continue to use the platform once they enroll in university and can therefore raise awareness among their fellow students. Furthermore, spring is wedding season. At 400,000 marriages (800,000 people) per year in Germany, we have max. 800,000 stag or hen nights. If we take a more conservative stance, that only 50% of best men/women organize a stag/hen night, we would still have 400,000 potential activities per year that could be organized through GroopDoo. We look forward to receiving and answering your questions.